A 13-year-old boy presented with a 1-year history of a gradually distending abdomen that was associated with constitutional symptoms, haematemesis and haematochezia that were exacerbated after taking traditional medicament. Admissions for similar episodes when he was 4 and 9 years old had yielded no diagnosis. A previous non-full-thickness rectal biopsy reported nonspecific changes. He was markedly cachexic with a grossly distended abdomen (Fig. 1) that was difficult to palpate. Shifting dullness was elicited and the flanks were dull. There was central hyper-resonance on percussion. Rectal examination was normal. An X-ray of the abdomen revealed a grossly distended large intestine. Ultrasound showed increased ascitic fluid. A total colectomy with an ileostomy was performed. 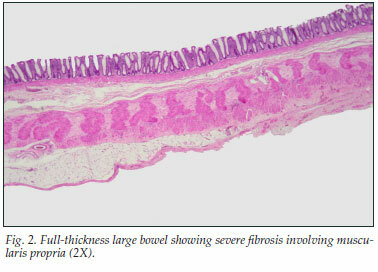 Histological examination of the colon (Fig. 2) was consistent with a diagnosis of hollow viscus myopathy. The patient died after a second laparotomy. Chronic intestinal pseudo-obstruction (CIPO) is a rare, severe syndrome with impaired gastro-intestinal motility leading to functional obstruction resembling mechanical obstruction. It usually affects elderly people with underlying co-morbidities, and early recognition and appropriate management are essential to reduce life-threatening complications.1 The condition may be idiopathic or secondary to other conditions. Most cases are sporadic. Familial forms with either dominant or recessive autosomal inheritance have been described. Histologically, it is classified into neuropathies, mesenchymopathies and myopathies, according to the predominant involvement of enteric neurons, interstitial cells of Cajal or smooth-muscle cells, respectively.2 Hollow visceral myopathy (HVM) is a myopathic cause of CIPO. This case was challenging because of the long duration, presence of constitutional symptoms, recent ingestion of traditional medicament, shifting dullness and dullness in the flanks on clinical examination, previous non-significant rectal biopsy, ascites revealed on ultrasound examination, and unhelpful laboratory investigations. Drs Naidoo, Schwartz and Murphy work in the Department of Paediatrics; Dr Mohanlal in the Department of Anatomical Pathology; and Dr Greeves in the Department of Paediatric Surgery, University of the Witwatersrand, Johannesburg.